I’ve written elsewhere about the general experience of visiting the Beer Bloggers’ Conference (BBC) and may go into more detail later about certain aspects of the conference. 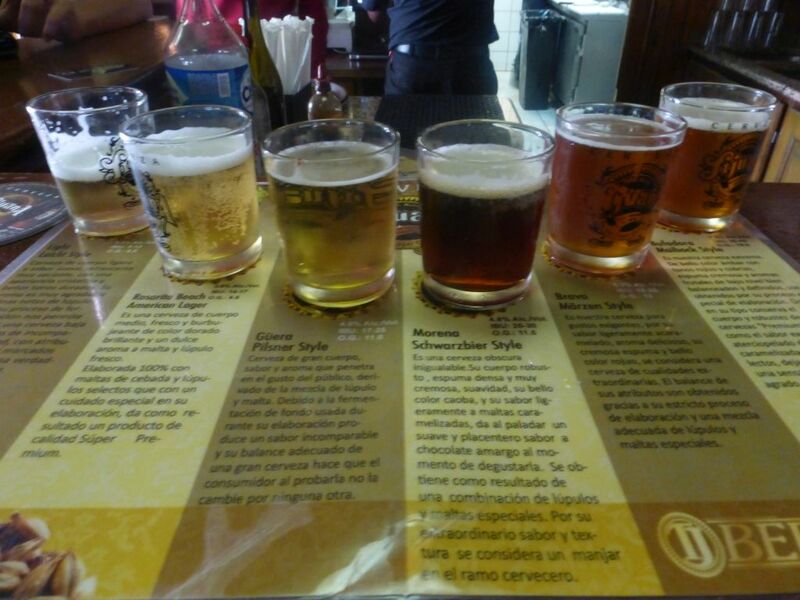 But I know one thing that many of my readers want to know is, did I try any interesting beers while I was there? The answer is a resounding yes, thanks to many breweries bringing a solid lineup of beers. Though this is not anywhere near all the beers I got to try at the conference, after a certain point your palate becomes shot to the point that you are not going to be able to pick out individual flavors. Rabid Beaver is so light in color that you might wonder where the rye is. The beer has a strong citrus hop flavor at the front with some spicy rye in the background. This one reminded me of the Helm’s Brewing Company Wicked as Sin Rye IPA. Though Wicked as Sin is a bit darker, they both have a nice blend of hop and rye. 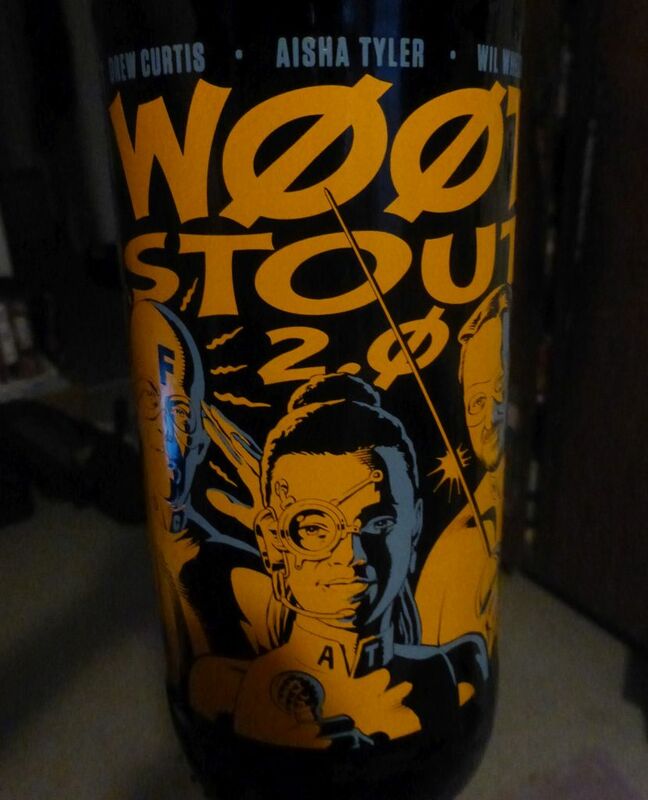 I really enjoyed this beer for the same reason that many licorice fans will probably hate it. You can’t really taste the licorice. 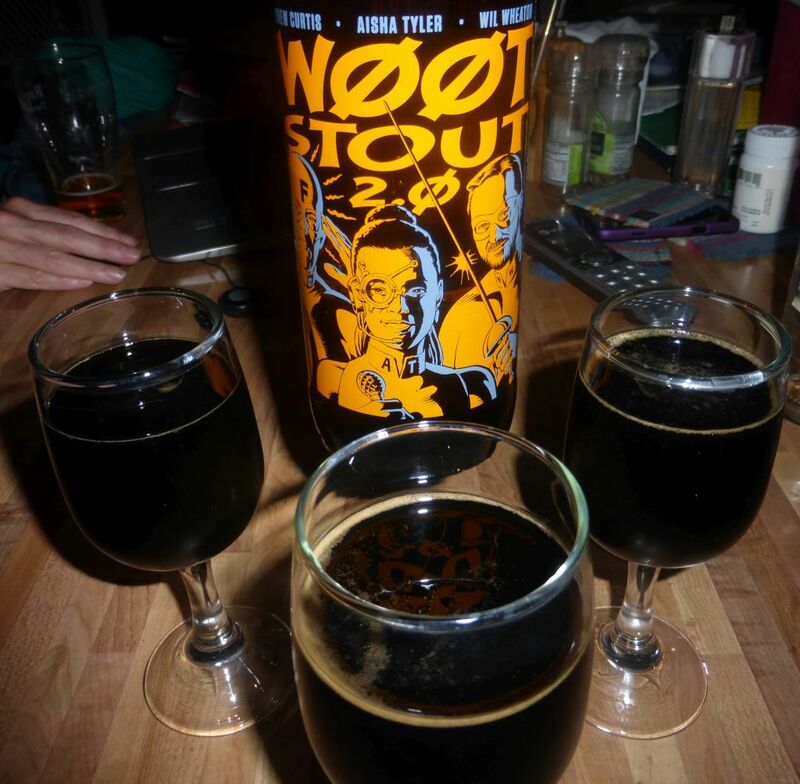 As a stout, the beer was very smooth and I found the licorice mostly in the background behind more prominent plum malt flavors. I’ve written about this one before but it helps to revisit a beer occasionally. Compared to the Rabid Beaver, this one was certainly much more dry and bitter. A very enjoyable IPA. I don’t remember being a fan of this the last time but it always helps to give a beer another try. Served in a can, the Hess IPA poured a nice light color and had plenty of pine hop flavor and a strong bitterness. The interesting thing about the Solis Occasus IPA is that the brewery is very open about changing the recipe for each batch as a way of experimenting with different varieties of hops. This is all the more reason that you should keep trying the Solis Occasus even if you don’t like it the first time. A black IPA is another way of saying you added hops to a stout. In this case, the Wookey Jack is solidly smoky and has some caramel malt flavors that balance well with some spicy rye. Everything is balanced out nicely by the addition of the hops, which I couldn’t really taste, but gave it a solid level of bitterness. 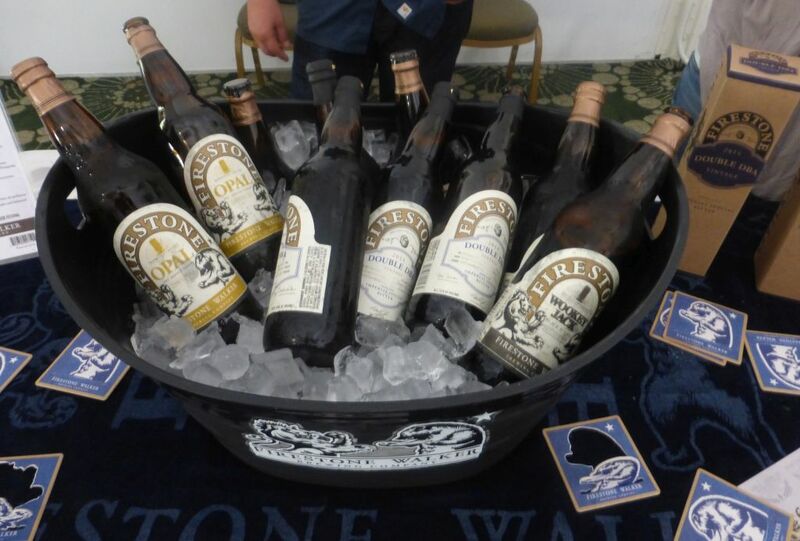 More recently, Firestone Walker has been releasing a number of special barrel-aged beers. I reviewed an earlier beer in this lineup called Stickee Monkee. The Double DBA starts with a double version of the double barrel ale and includes aging in oak barrels and later a year in a bourbon barrel. I really loved the caramel malt flavors and the boozy bourbon I tasted. The sweet flavors combined and reminded me of roasted coconut. This one was even more impressive than Stickee Monkee. 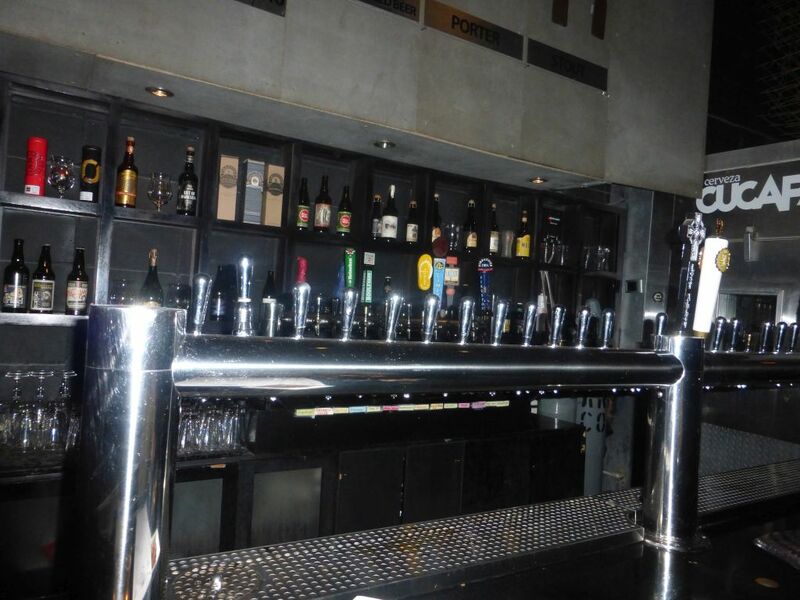 Have you tried any of these beers listed here? If so, what do you think? Let me know in the comments! The Beer Bloggers Conference is a yearly event in which bloggers come together from all over the country (there is a separate one in Europe) to discuss ways to better reach our audience and meet with some of the big breweries. This year’s happens to be in San Diego, which means I don’t have to pay for airfare or hotels in order to join everyone. Among other things, I will get a chance to be a part of a special dinner at Karl Strauss and a separate special dinner at Stone. Expect to see the majority of the posts on Friday August 22nd in the afternoon and evening with even more posts to come on Saturday August 23rd, which will be an all-day extravaganza. If you aren’t interested in learning about the conference in real time, don’t worry! I will be providing more in-depth coverage of the event once it is all over, bringing together some of the most interesting real-time updates as well as some additional details about what I got to experience. And yes plenty of the coverage will be about the different beers I get to taste. In this first in a new series of posts I like to call beer roundups, I will explore some of the interesting beers that I have tasted over the past week or two. The beers featured here will primarily be ones that you can purchase in the store in 22oz bottles or six-packs. My hope is to provide you with some helpful advice about whether you should pick up that interesting beer in front of you enticing you with its unique (or boring) design. After all, it is better to drink from the comfort of your home so you don’t get a DUI. This beer roundup series is part of my effort to explore different ways of writing for the audience here. Some people like the format of quick short posts about what I am drinking. If this is you, please follow me on Facebook. Others prefer to read a more lengthy explanation of what was good. Most of these beers showed up on my Facebook page at some point. By gathering multiple reviews into a single post I can make sure everyone has access to the same content even if they don’t want to use Facebook. This beer roundup will examine the following beers: Pizza Port Brewing* Sessionable IPA, Ska Brewing Modus Hoperandi IPA, Modern Times Brewing Phalanx IPA, and Ballast Point’s Bavarian Hopped Double IPA (on tap only). 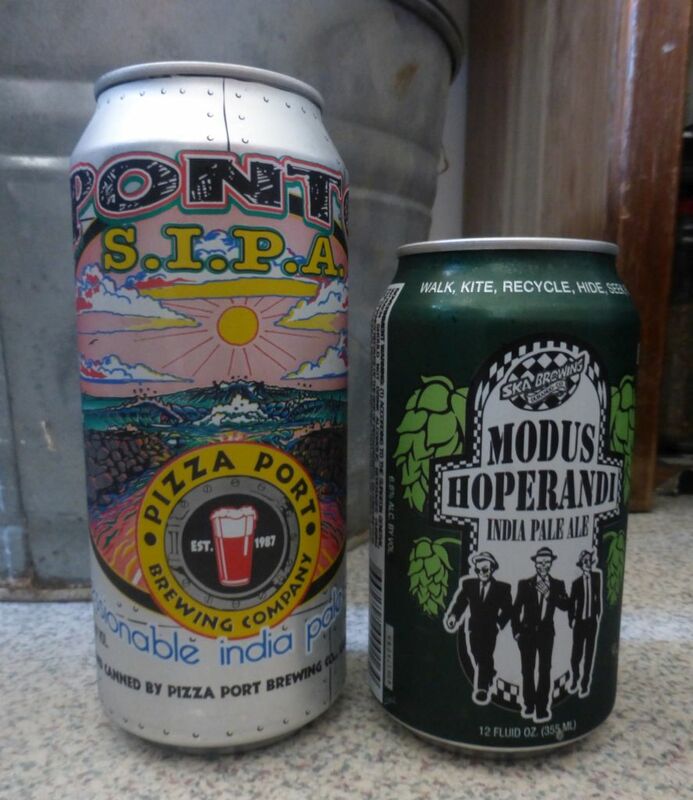 *Pizza Port Brewing should not be confused with Port Brewing/Lost Abbey. The two are distinct breweries both making fresh beer throughout San Diego. It is understandably a little confusing because the logos do look very similar. I was not very excited by the look of this beer so I might have avoided picking it up if I hadn’t been recommended it by someone working at BevMo. Session IPAs are all the rage now and this one fits in nicely with others in the same style. At a mild 4.5% it is perfect for your first beer on a Sunday and yet it has plenty of fantastic hop flavors like I have come to expect. This one is heavy on the citrus side and has a medium bitterness. I especially like that it was released in six-packs of pint cans because I am really starting to like these pint cans. This has many similar hops to the Fortunate Islands Hoppy Wheat from Modern Times and satisfies me just as much. This is a great one to turn to if you can’t find any Fortunate Islands. I wasn’t familiar with this brewery at all before I saw this beer in the store but who can resist the design of this can? Gangsters, FBI lingo, and bountiful green hop buds call out to me like none other I have seen. This IPA has plenty of strong citrus and pine flavors with a smooth caramel malt backing. I really liked how well the caramel malts worked with the hops featured here. Though I typically don’t like darker maltier IPAs, the malt flavors are subtle enough that they don’t overpower the rest of it. 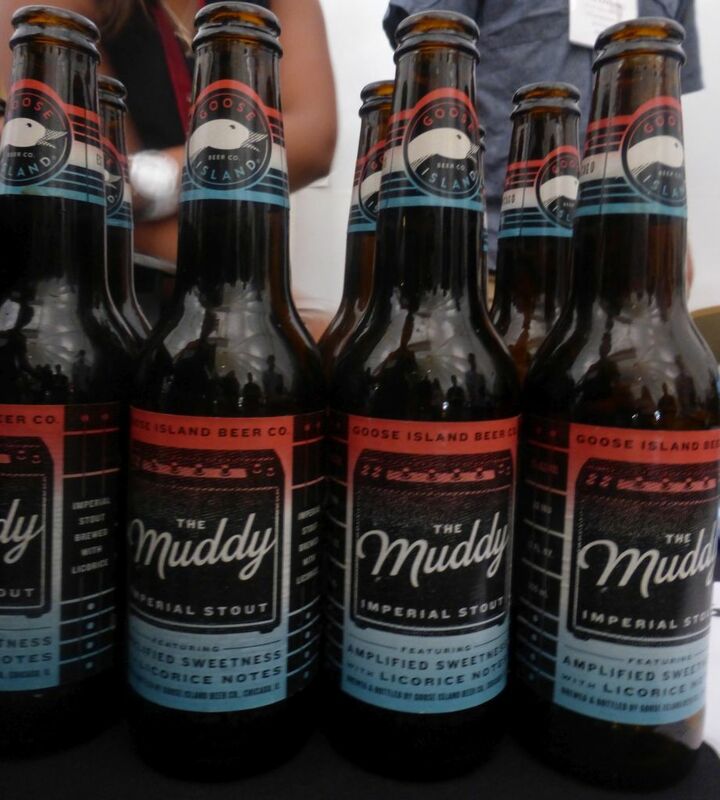 Modus Hoperandi is sold in six-packs of 12-ounce cans. I might have a new favorite here. The Phalanx IPA is originally only available at the brewery and most likely you will have to go there to get a bottle. I stopped by so that I could give it a taste before I bought some and ended up leaving without any bottles to take home. That isn’t to say that the beer is bad, it just didn’t hit the flavors I crave so much. This is an IPA that grows on you because it doesn’t immediately attack you with potent hops. It shares some dank characteristics with the Modern Times Blazing World (one of my favorites) but focuses the hop flavors more heavily on flavors described by the brewery as juicy. This juicy flavor comes through as a sort of extra sweet ripe melon. The hops in here taste like they are related to the ones Stone used in the recent Unapologetic IPA. 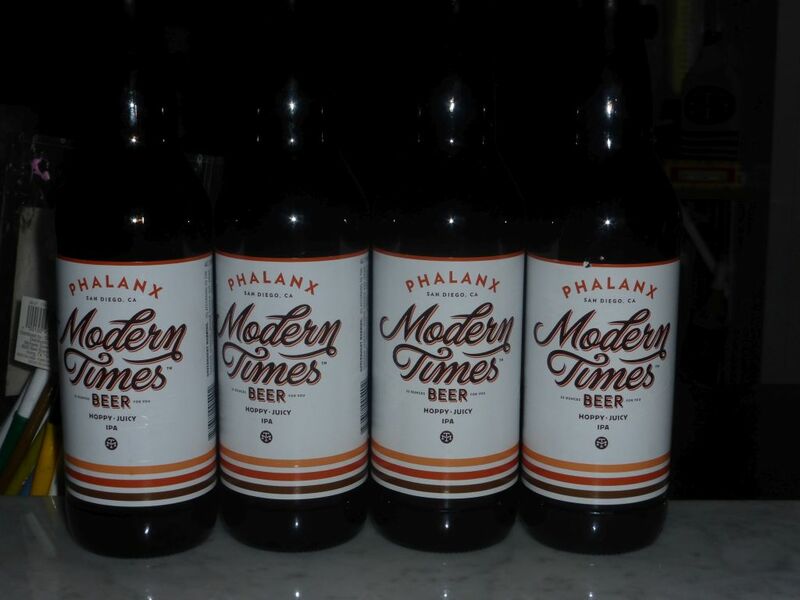 Bottles of Phalanx at the brewery. The Bavarian Hopped Double IPA is only available at the Little Italy Ballast Point location in San Diego and probably won’t stay on tap for long with the unique flavors it displays. When I stopped by the brewery for a taste I was immediately struck by how sweet and flavorful this beer was without any significant bitter flavors. I would place the IBUs of this beer somewhere around 40 if not lower (which puts it about as bitter as the Fortunate Islands by Modern Times). Most of the flavors I noticed reminded me of ripe tropical fruit. This might be the double IPA to get your friends to try if they are scared of the bitter hop-bombs that have become regular around San Diego. 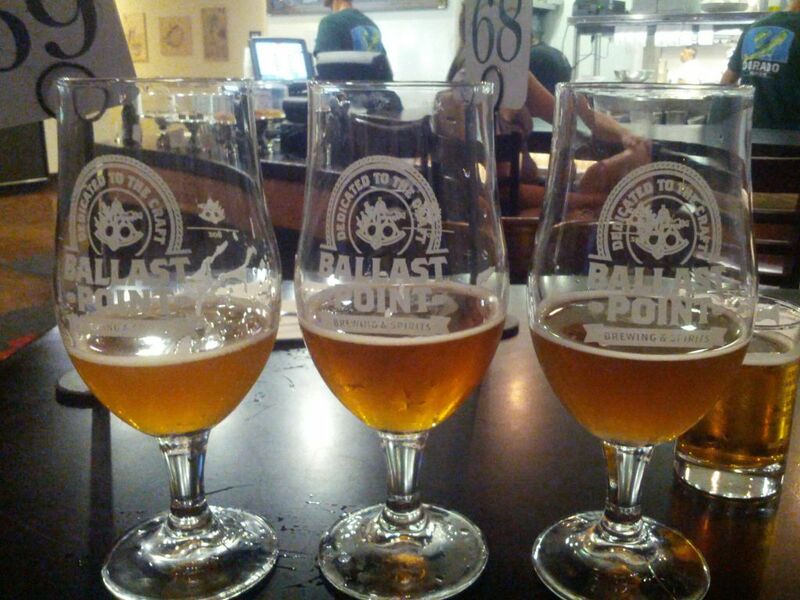 Tasters at Ballast Point. Bavarian Hopped Double IPA is on the left.